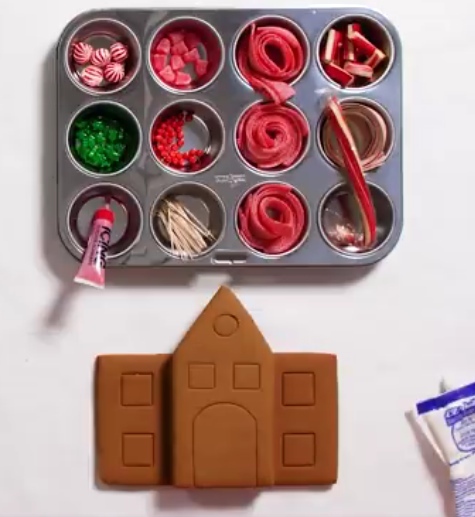 The first hack was a Peppermint Palace with candy cane window valances and peppermint ball topiaries! We organized ll our ingredients into a muffin tin to keep things neat! And here it is finished, with its sour belt roof tiles and a sprinkle of coconut snow! For the second video, I created a log cabin using pretzel rod "logs'. I used skinny pretzel sticks to make the door and windows. Luckily, any messiness with the icing "glue" looks like snow! Here are the items used to make the log cabin. Watch the videos for more details! The last house, a "snowy retreat" was my favorite to make, Sugaring the walls and snipping marshmallow roof tiles was fun and pink is my favorite! As you'll see in the video, I watered down the royal icing that came in the kit and painted it on the walls as a glue to adhere the sanding sugar over. This gave the walls a glittery and snowy look. Check out our book, Candy Aisle Crafts, for easy cookie cottages, a great starter project for decorating gingerbread houses.